In Anti-fluoride activists define kangaroo court as “independent” I promised to review the anti-fluoridationist “International Peer Review.” This is Anti-fluoride critique of the recent review Health Effects of Water Fluoridation: a Review of the Scientific Evidence produced by the Royal Society of NZ together with the Office of the Prime Minister’s Chief Science Advisor (hereafter refered to as the Royal Society Review). So here is my peer review, of a review, of a review. “I can’t be bothered to show step by step where this review does not meet the standards of critical scientific analysis. . . . Chris is right on the ball in critiquing this review. I’m not sure many people will appreciate just how detailed he is. “The effort to critiquing every paragraph of the NZ review is taxing but once it is done and posted on the website, it would be most useful for those people who want to take on the promoters of fluoridation who will undoubtedly use this review to support the profluoridation agenda and point to how unscientific, one-sided, politically motivated this review really is. Now, the specific issues raised in Theissen and Neurath’s comments. The Royal Society Review found some population groups may exceed the prescribed “safe” levels of F intake. So Theissen concludes that “the fluoride concentration in drinking water is too high and should be lowered.” However, she ignores completely the review’s comments on this issue. I also discussed the issue of risk for formula-fed infants in my article When politicians and bureaucrats decide the science and in my exchange with Paul Connett. Here I note how “peace of mind” advice to those parents who may be concerned about increased risk of dental fluorosis gets presented by anti-fluoride people as safety warnings. Theissen discusses the adequacy of a stands for F intake at length but her only beef with the Royal Society Review on this appears to be that it doesn’t challenge existing standards. She herself considers that these standards should be revised to “obtained values much lower than those currently considers desirable by the New Zealand government.” But here she is promoting a personal agenda and not objectively critiquing the Royal Society Review. Theissen considers that the NZ review offered “little documentation for the beneficial effects of fluoride.” Strange – has she read the review? Table A2 lists 21 major reviews it considered and 7 New Zealand sources were included – the 2009 NZ Oral Health Survey and regional studies in Otago, Southland, Canterbury, Wellington, Auckland and Northland. If that was insufficient for Theissen then why is her only counter to mention John Coulquhoun’s reminiscences in his article of 1997? It is not enough for Theissen to use his assertions “that there are virtually no differences in tooth decay rates related to fluoridation” and “25 percent of children had dental fluorosis.” But has she bothered to check out his data at all critically? Why no more citations supporting her claim? Apart from the wishful thinking displayed in his interpretation of a statistically non-significant difference he has glossed over the fact that both fluoridated and unfluoridated groups were receiving fluoride treatments of one sort or another! “It is important to note that the seemingly high prevalence of fluorosis reported in some studies and systematic reviews includes mainly mild and very mild (and sometimes questionable) degrees of fluorosis, with only a small proportion that would be considered to be of aesthetic concern. Surveys have shown that very mild to mild dental fluorosis is not associated with negative impact on perception of oral health, and that adolescents actually preferred the whiteness associated with mild fluorosis. In a recent study, adolescents answered a questionnaire regarding the impact of enamel fluorosis on dental aesthetics, older adolescents rated photographs of mild fluorosis more favorably than younger ones. A fluorosis score indicative of moderate fluorosis was the level considered to have aesthetic significance. Carious teeth were rated significantly lower than fluorosed teeth. I partially agree with Neurath’s charge on the inadequacy of the Royal Society’s comment on the standardised weighted mean difference in IQ scores discussed by Choi at al (2012). Some people have made a lot of the confusion around this issue. I would like someone with good statistical skills to comment on the risks involved in making such an analysis in a meta study where there is no conformity of experimental design or treatment in the individual studies. Wikipedia lists a number of pitfalls in statistical meta analysis, two of which seem particularly relevant here – publication bias and agenda-driven bias. In my article Quality and selection counts in fluoride research I described how the studies used had been selected and it is hard not to see an agenda behind this. So, I do think Choi et al’s statistical analysis is questionable. However, this issue is irrelevant to CWF because of the generally high drinking water fluoride concentrations used in these studies. Theissen and Neurath resort to the special pleading in their efforts to avoid that problem. At first sight this seems relevant to CWF and Paul Connett, like many anti-fluoride activists, stress this study in defending the relevance of Choi et al (2012). Strange then that none of them actually discuss the study details. Perhaps we should. Lin et al (1991). The relationship of of low-iodine and high-fluoride environment to subclinical cretinism in Xinjiang. Iodine Deficiency Disorder Newsletter, 24–25. It has few of the details we normally expect in scientific papers. For example, I would like to know what the range of fluoride concentrations was in the drinking water, what other dietary intake occurred, how was the “dental fluorosis” observed defined, etc. Children from low iodine areas were compared with a group from another area that had received iodine supplementation. About 15% of the children suffered mental retardation, 69% of these exhibited subclinical endemic cretinism. The effect of iodine supplementation was clear, the effect of fluoride not so clear. But anyway, hardly a report to hang any conclusion on about CWF in New Zealand. “several of the studies did consider each of these potentially confounding factors, and at least one group of researchers (lead by Xiang) considered all of them and more.” [yes, one – “all and more” – but why not consider Xiang in detail then? Why try to spread his thoroughness throughout all these meagre studies? Anti-fluoride people also often single out the study of Xiang, et al (2003). Effect of fluoride in drinking water on children’s intelligence. Fluoride, 36(2), 84–94, because unlike the others it is more detailed. Xiang’s team has studied areas where fluorosis is endemic. 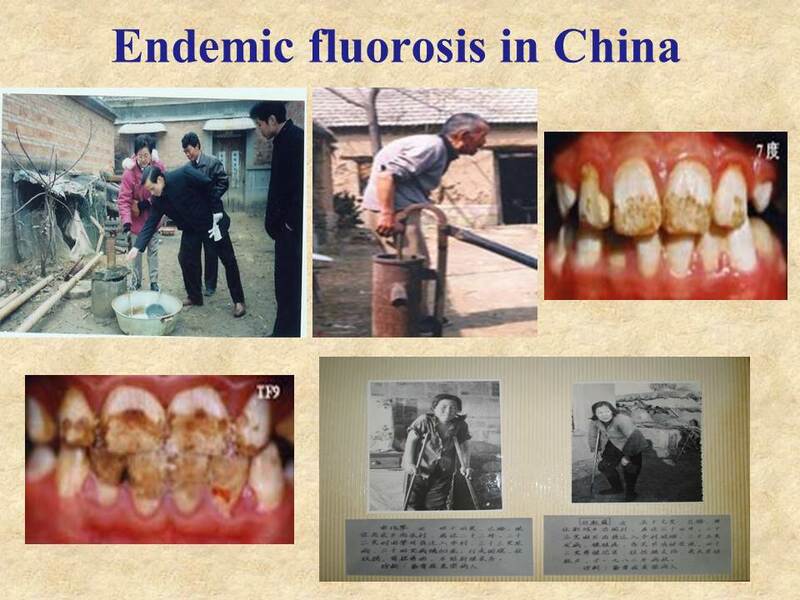 Here is a slide from his presentation to Paul Connett’s recent anti-fluoride “get-together” (Xiang 2014). This is not the very mild dental fluorosis attributed to CWF. Now I think severe dental fluorosis like this would create learning difficulties for children in the same way dental decay does (Seirawan et al 2012). I suggested this in Confirmation blindness on the fluoride-IQ issue. Presumably Xiang could have analysed his data to check if the apparent IQ drop was correlated with the prevalence of dental fluorosis. I would think that could be an obvious first step. Again Theissen resorts to special pleading converting a vague possibility into an established “fact” in an effort to justify the unquestioned use of animal studies using high concentrations. Mullinex et al (1995) also attempted to justify use of similar animal studies by comparison of blood plasma F levels. However, there is a huge range and variability in these levels so extremely easy to make subjective justification. I am suspicious of such speculation. While I am happy to acknowledge that it may be too simple to equate the effects for humans and animals at the same intakes, I think Theissen’s assertion “animals require much higher exposures” is straw-clutching. Millunex et al (1995) exhibited the same straw-clutching when she asserted plasma levels in her rats were similar to those in “humans exposed to high levels of fluoride.” Anti-fluoride activists love to quote Mullinex while ignore or downplaying the word “high.” She was quoting plasma F concentrations for children receiving 5 – 10, and 16 mg/L F, 10 or 20 times higher than used in CWF! But the huge effect of treatment time on plasma F concentration in rats must surely warn any objective reader to be very careful about these sort of claims. (Rats receiving 125 ppm F had plasma concentrations of about 0.1 mg/L after 6 weeks exposure but 0.64 ± 0.31 mg/L after 20 weeks). Theissen appears not to have properly read this section of the Royal Society Review. The Royal Society Review evaluated current scientific knowledge on health effects of fluoridation. It was requested by the Auckland Council on behalf of several local Councils. They wanted a review of the scientific evidence for and against the efficacy and safety of fluoridation of public water supplies. This requirement arose from the recent campaigns by anti-fluoridation activists who targeted individual councils with a barrage of misinformation. We should understand that the size and accessibility of the Review is aimed at informing public decision-making on the issue. For this reason it also deals with New Zealand aspects. It is not meant to be as extensive and detailed as the 530 page US National Research Council report. Hopefully any future consideration of community water fluoridation by local body councils will be better informed because of the Royal Society review. In particular it should help counter the sort of misinformation that has confused some councils in the past. Colquhoun, J. (1985). Influence of social class and fluoridation on child dental health. Community Dentistry and Oral Epidemiology, 13(1), 37–41. Bassin, E. B., Wypij, D., Davis, R. B., & Mittleman, M. a. (2006). Age-specific fluoride exposure in drinking water and osteosarcoma (United States). Cancer Causes & Control : CCC, 17(4), 421–8. Eason, C., & Elwood, JM. Seymour, Thomson, WM. Wilson, N. Prendergast, K. (2014). Health effects of water fluoridation : A review of the scientific evidence (p. 74). Royal Society of New Zealand and Office of the Prime Minister’s Chief Science Advisor. Lin Fa-Fu, Aihaiti, Zhao Hong-Xin, Lin Jin, Jiang Ji-Yong, Maimaiti, and A. (1991). The relationship of of low-iodine and high-fluoride environment to subclinical cretinism in Xinjiang. Iodine Deficiency Disorder Newsletter, 24–25. Ministry of Health. (2010). Our Oral Health: Key findings of the 2009 New Zealand Oral Health Survey. Wellington: Ministry of Health. Mullenix, Phyllis J., Debenstein. Pamela K., Schunior, A., & Kernan, W. J. (1995). Nuerotoxicity of sodium fluoride in rats. Neurotoxicology and Teratology, 17(2), 169–177. National Research Council. (2006) Fluoride in Drinking Water: A Scientific Review of EPA’s Standards. Washington, DC: The National Academies Press. Seirawan, H., Faust, S., & Mulligan, R. (2012). The impact of oral health on the academic performance of disadvantaged children. American Journal of Public Health, 102(9), 1729–34. Thiessen, KM., & Neurath, C. (2014). International Peer Review of the Royal Society/PM Science Advisor Office Fluoridation Review. Internet document. Xiang, Q. (2014) Fluoride and IQ research in China. 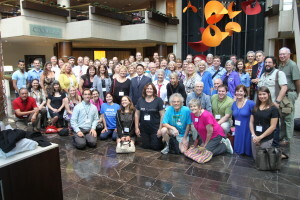 Keynote Address at FAN’s 5th Citizens’ Conference on Fluoride. This entry was posted in Health and Medicine, New Zealand, politics, SciBlogs, science, Science and Society and tagged fluoridation, fluoride, SciBlogs. Bookmark the permalink. Bing bong: bing bong: no matter how many times you bat it back and forth it won’t change the basic fact that it is a violation of a person’s right to choose what they put into their bodies: AND it is pure insanity to tip highly toxic industrial waste into any water supply, let alone drinking water: AND it makes me – and probably thousands of others, sick . . . end of story! Hi Ken – I see you are still engaging in bombing us with screeds of writing but nothing by way of the evidence on which support for community water fluoridation is founded. I am amazed at how you and your fellow sceptics can so readily defend the scant and often skewed affirmative material but wax lyrical and long when highly experienced and knowledgeable people present an alternative standpoint. It just doesn’t ring true and makes you look more like a zealot than someone dedicated to truth in science. I now drink (mainly) distilled water and try and procure my processed food from non fluoridated sources. It is a pain in the arse and expensive but it has paid off in that my general health and wellbeing is better now than it has been for years. I have even surrendered my mobility parking permit and am back in the gym 2 days a week. How are your teeth or are they still crumbling away? Have a happy day! So, nothing to say to my critique then, Trevor? Interesting that Trevor does not comment on the critique but instead explains how he exercise his complete freedom of choice in regard to fluoridation.